The post below is a guest contribution by Matthew Montagu-Pollock of Global Property Guide. The latest survey of the Global Property Guide showed that 17 out of 35 countries recorded increases in house prices over the year to end Q3 2010 (based on inflation-adjusted house price changes). Of the 18 countries that experienced house price falls, 11 recorded slower rates of decline. The Global Property Guide’s statistical presentation uses price changes after inflation, giving a more realistic picture than the more upbeat nominal figures usually preferred by real estate agents. After a long and sharp housing crisis, Latvia is finally back in the limelight. Latvia outperformed all countries in the GPG survey, recording a house price rise of 24.73% over the year to Q3 2010. This was in sharp contrast to the 59.70% drop during the same period last year. However, the average Riga apartment price at 610 Euros per square metre in Q3 2010, is still 45% lower than the average price in Q3 2008. Latvia was the only European country that had a double-digit increase. Following Latvia were Finland and Norway with year-on-year increases of 5.99% and 4.38% respectively. House prices in both countries have been rising since Q3 last year. Germany, the UK, Switzerland and Denmark had modest increases of only over 1% year-on-year to Q3 2010. Ireland had the worst annual price decline among countries in the survey, with house prices down 14.94% over the year to Q3 2010. Irish house prices have been falling for the past three years, and the declines show no sign of ending. Lithuania has not recovered yet. The Ober-Haus apartment price index, which reports apartment prices in Lithuania’s five largest cities, slipped by 10.36% during the year to Q3 2010. Prices were 39.2% below their peak level in Q4 2008. Nevertheless, the recent year-on-year decline is a big improvement on the 31% fall experienced during the same period of last year. Recovery has eluded the US housing market. The seasonally-adjusted purchase-only house price index was down by 4.31% over the year to Q3 2010, worse than the decline of 2.41% during the previous year. The US recorded a modest increase in house prices (on a quarter-on-quarter basis) in Q2 2010. The tables quickly turned during the next quarter, and prices were down 1.68% during Q3 2010. Despite government interventions, house prices in some Asian countries continued to surge in Q3 2010. The rapid economic expansion in Singapore canceled out anti-speculative measures implemented by the government. House prices rose strongly by 18.98% over the year to Q3 2010, even after the imposition of stamp duty, plus tighter financing conditions, and restrictions on home ownership. Also fuelled by strong economic growth, Hong Kong’s house prices surged further in Q3 2010, moving up by 17.84% from a year earlier. Hong Kong had the largest quarter-on-quarter increase (5.94%) of any location. Taiwan has been successful in taming its rising house prices. On a year-on-year basis, house prices were up 6.97% to Q3 2010, a deceleration from last year’s increase of 10.87%. But house prices fell 1.5% during the latest quarter. Japan has seen house price rises since January 2010. In Tokyo metropolitan area, the average price of existing condominiums increased 5.07% from a year earlier. Indonesia and Thailand both experienced house price falls during the year to Q3 2010. Thailand had the worst quarter-on-quarter drop of any country. House prices in Israel have surged continuously since 2009, and in the year to Q3 2010 prices rose 14.12%. This marked the 5th consecutive double-digit quarterly y-o-y rise in prices of owner-occupied dwellings in Israel. Source: Global Property Guide, November 26, 2010. The interesting chart below on the movement in global residential property prices comes courtesy of the Global Property Guide, a site comprising probably the most extensive global data base in this space. The table shows house-price changes for the year ending with the latest quarter for which data are available, compared with price changes for the equivalent previous year-long period. As indicated, some countries’ real estate markets are moving down (most notably Latvia, Lithuania, Ukraine, Ireland, Bulgaria, Thailand, Slovakia, Iceland, Spain, Croatia, the Netherlands, Denmark and Greece), whereas others are rising (Hong Kong, Singapore, Taiwan, Australia, Israel, Finland, Norway, China and the U.K.). Where to buy? The table below shows the recommendations of the Global Property Guide and serves as a starting point. In order to obtain their detailed motivation, click here for a comprehensive report. • Further increases in non-performing loans due to a high unemployment rate and significant weakness in the real estate sectors. 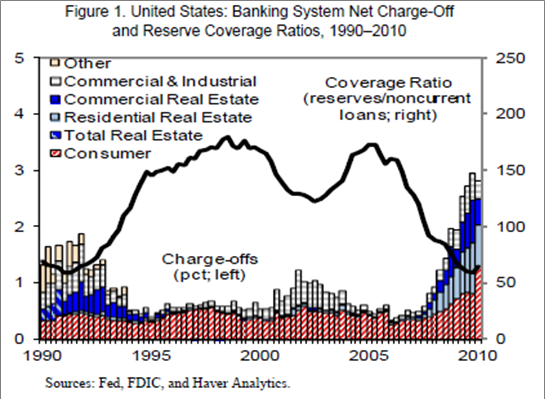 • Credit quality in the commercial real estate (CRE) sector. About $1.4 trillion of CRE loans will mature in 2010–14, nearly half of which are 90 days or more past due or “underwater”. • Housing prices − The very high level of underwater mortgages increases the risk of strategic defaults and further losses to banks and mortgage-backed security (MBS) investors. Market perception of sovereign risk, sluggish growth, and mounting fiscal deficits and debt are also identified as major risks to the economy and the financial system. The IMF noted financial institutions will face rollover risks with large loan maturities in 2011–13, which could bring rapidly rising foreclosures and bank losses. The small and medium-sized banks, which are most heavily exposed to the commercial real estate sector, are causing the most concern. 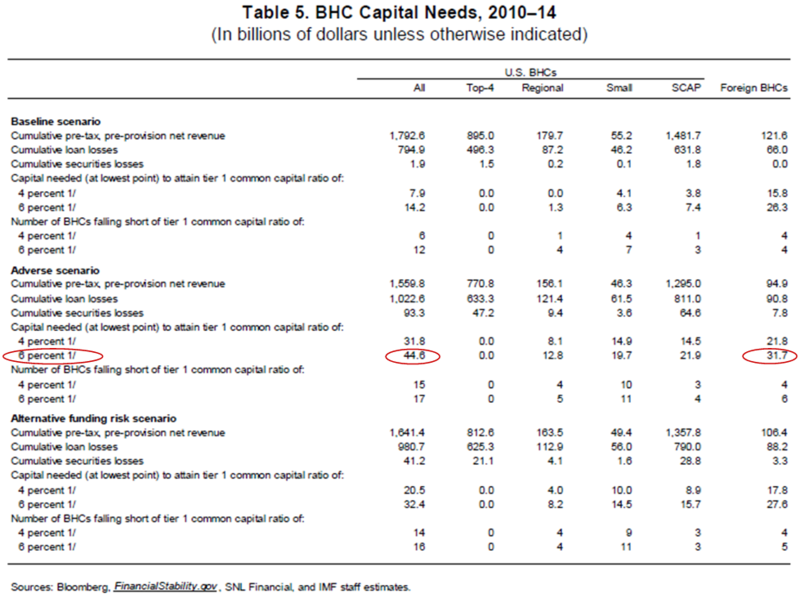 Since bank balance sheets remain fragile and under-capitalized (Figure 1), under an “adverse scenario” small and regional banks as well as subsidiaries of foreign banks would incur $1.113 trillion of cumulative loan losses from 2010 to 2015 and need as much as $76.3 billion (i.e. a TARP 2.0), additional capital to meet a tier one ratio of 6%. Other research reports also paint an equally gloomy picture. According to an analysis by Realpoint, reported by HousingWire, delinquencies in commercial mortgage-backed securities (CMBS) in the U.S. increased to 7.2%, and more than triple the rate a year ago. In May, the total delinquent unpaid balance for these loans reached $57.3 billion. While the $40-80 billion capitalization numbers probably will not take the entire U.S. economy into a double-dip recession, they will likely put a significant drag on GDP and earnings in the financial sector, as well as the broader equity market for the next two to six quarters. With the easy year-over-year earnings beat coming to an end, the best of the earnings may have already come to pass. As such, now would be a good time to take some profit off the table for another day, another entry point. Source: Dian Chu, Economic Forecasts & Opinions, August 4, 2010. Is real estate rolling over? A useful source for some guidance on the prospects of real estate is Robert Cambell’s Campbell Real Estate Timing Letter (via Dow Theory Letters) from which I have excerpted the paragraphs below. “Now is not the time to jump into the real estate market because some analysts are telling you we’ve hit a bottom. NOT only are my timing models telling us that the market hasn’t turned yet, but if the Fed stops buying mortgages via its quantitative easing at the end of the month, and if the government allows its tax credits to expire as planned in June, chances are good that we’ll see lower housing prices through the rest of this year – not higher prices. “Lifting caps on Fannie and Freddie: Do you wonder why? On December 24, 2009 – in a kind of Christmas Eve surprise – the Treasury decided to lift the caps on how much bailout money the failed mortgage giants, Fannie Mae and Freddie Mack could receive in order to stay in business. The previous caps were $400 billion for both companies. Not anymore. Now the US taxpayers are back on the hook for unlimited financial support to keep Fannie and Freddie functioning – which could amount to as much as $8 trillion in taxpayer liability. “Why did the Treasury do this? Because today, the FHA, Fannie and Freddie government agencies fund 90% of all U.S. mortgages and guarantee 97% of them. And in January, Fannie and Freddie reported combined losses of $94 billion for 2009. In other words, if Fannie and Freddie can’t keep providing hundreds of billions of dollars worth of mortgage financing, the real estate market will likely collapse. This is decidedly bearish commentary and leaves me wondering whether the SPDR S&P Homebuilders ETF – ticking all the boxes of a cyclical bull market – is getting it wrong. Then again, the same question can be asked about the US stock market. US residential property – a good buy? By Prieur du Plessis, on March 9th, 2010 posted in: Investment, Real Estate 9 people had their say - chime in! The chart below, the Affordability Index of US residential property, comes courtesy of the New Observations on Real Estate, Mortgages & Life blog. The Index is computed by factoring in home prices, mortgage rates and income. Let’s have an open thread and discuss in the comments section whether this represents a buying opportunity, or is it a question of fools rush in where wise men fear to buy? Click on “Comments” below the heading of this post and share with me your views on whether I should part with my South African rand for a residential property in some part of America. D.C.-area developer Jeff Neal gives the Huffington Post Investigative Fund a tour of empty commercial properties just blocks from the Capitol. Hundreds of small and medium-sized banks are facing huge numbers of possible defaults by builders who erected thousands of office towers, condominiums and shopping centers with the easy credit available five years ago. “Commercial real estate loans generally have terms of five to seven years. Many of the loans issued at the height of the credit bubble are coming due. By mid-November, $150 billion worth of commercial properties, about 7,500 in total, were in distress, according to Real Capital Analytics Research,” reported The Huffington Post. 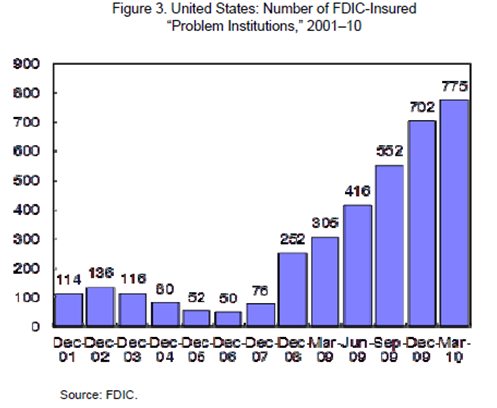 More than 400 banks are on a problem list maintained by the Federal Deposit Insurance Corp, largely as a result of commercial debt. Source: YouTube and The Huffington Post, November 20, 2009.